After climbing the last short bit of hill up to Rt. 89, we turned west and were soon flying down the 6% grades at an easy 35 mph. Soon we had arrived in Mt. Carmel Junction. Ah, civilization. RV's. Tour buses. Golf courses. Tacky gift shops. Indeed, we had arrived at an oasis in the desert. Since Rich and I were the first to arrive in town, we stacked our bikes in front of a hotel/restaurant so Freda and Rick could find us, then went inside in search of caffeine and cholesterol. The sign out front proudly advertised "Ho-Made Pies". Apparently "Ho" means something else in Utah than it does in Connecticut. Since Rick had had a particularly difficult time of it yesterday, he decided that he would try hitch-hiking from here up to Hatch. Since the rest of the day promised to be almost entirely uphill, this would allow him to recover and be ready for the more difficult climb up to Bryce Canyon tomorrow. There were lots of cyclists around this morning. There are a number of companies that provide sag-supported cycling trips around the National Parks of southern Utah. 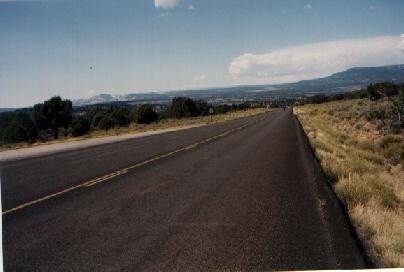 Since we were now on the direct route between Zion and Bryce Canyon, there were a number of groups spread out along the road. While I'm not a particularly competitive person, I must admit there's a certain satisfaction in passing an unladen cyclists on my loaded touring bike. Big grin. "Good Morning!". It was a pleasant day's ride. Lots of climbing, but frequent stops and changing scenery distracted me from the work. As we neared the top of the pass at Long Valley Junction, I was starting to feel the effects of the altitude. Rich and I took a rather long break at a small store located right at the height of the pass, then flung ourselves down the other side. Good Lord, cycling is fun! We stopped at a tourist info center just outside of Hatch and waited for Freda. As Freda finally came into view, she simply waved and kept on. She later told us that she was enjoying the downhill, cruising along at a good speed, and no way was she going to stop and interrupt it! We finally arrived at the campground and were just leaning our bikes up against the wall ready to go inside when a pick-up pulled into the parking lot and Rick hopped out and unloaded his bike from the back. Just the kind of perfect karma one comes to expect on a bike trip! While Rich and Freda were off doing laundry, Rick and I spent a bit of time chatting with a Brit who was touring parts of the West by van with some friends. It was embarrassing to have to explain to him that here in the US bicycles are mostly seen as toys rather than vehicles. When he wondered why we didn't stay in hostels and save the chore of lugging camping and cooking gear along, we explained that hostels are a rarity here and it isn't practical, or even possible, to travel from hostel to hostel. He did pique a latent intention of mine to get "over the pond" for a British tour someday soon. So many destinations, so little vacation time!